Twisted threads of gold, yellow, orange, red, blue and green, with a silver hook clasp. The hemp is whipped with the embroidery threads. 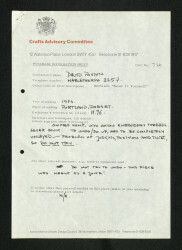 Twist It Yourself, David Poston, 1975, Crafts Council Collection: J66. Photo: Todd-White Art Photography. Fed up with endless mindless shipping and work in general, and enjoying the memory of the rings you couldn't put on in Electrum's Dutch "Revolt in Jewellery" exhibition, I was going to make this a complete quoil, impossible to put on. However, my financial conscience nagged me, so I compromised and made it ALMOST impossible to put on - but wearable if anything/ one was SILLY enough is want to. As a practical necklace, therefore, it is, on purpose, a disaster. But as a form form a necklace ignoring the problem of getting it on. It would be nice to make a practical version.